The thing is, I have been exposed to many different type of saag dishes (disclaimer: I could live off my Mama’s Pakistani saag dish for a very long time). I especially love saag that is made with rapini and spinach. 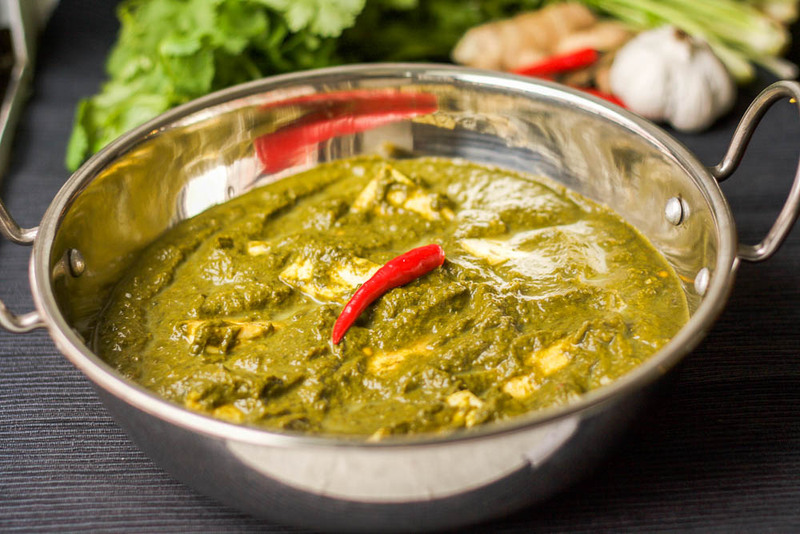 Unfortunately Pakistani saag is often drenched in ghee, or clarified butter. This isn’t necessarily bad as ghee can have many health benefits, one of them being easier on your digestive track than other types of dairy. Nevertheless, it’s still dairy so if you can’t have dairy then you can’t have ghee. Never to fear though, happygutters (well, that sounds kind of strange :S), saag has just become vegan with tofu and olive oil instead of ghee. I like to call this one the “Vegan Saag Paneer” 🙂 Enjoy! Drain tofu - I usually put it between two plates and put something heavy on it for about 20 minutes, then I drain the liquid. Place ALL saag ingredients into a saucepan, stir and bring to boil. Lower to low-medium and allow to cook for about 40 minutes (or about 25 minutes if you have a pressure cooker). Check and stir it every 5-10 minutes to make sure it doesn't burn or dry out (add more water if this is the case, but don't add too much - you don't want it to be watery). You can to cook it until it is really soft and until the water has evaporated. Remove from heat and, if you like, use your hand blender or food processor to blend it (this makes really smooth, like saag you would get at a restaurant). While the saag is cooking, make the tarka. Place your olive oil or vegan butter in a frying pan over medium heat and add the ginger and garlic just until they start to brown. Add the tarka to the saag when it is cooked and mix well. Cut tofu into thirds lengthwise and eighths crosswise. Heat 2 teaspoons oil in a large nonstick skillet over medium-high heat. Cook tofu, stirring gently every 2 to 3 minutes, until browned on all sides, 6 to 8 minutes. Tarka refers to the final seasoning of an Indian/Pakistani Punjabi dish. This dish also freezes really well. 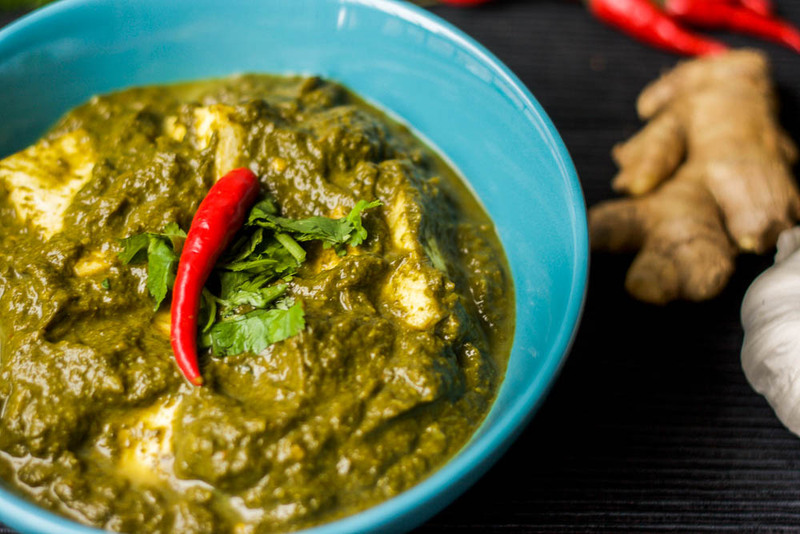 If you do plan on freezing it, don't add the tofu to the saag. Rather, eat the tofu on the side as the tofu doesn't freeze as good. We had our first couple blind date earlier this week (my partner invited over a friend and his wife both of whom I’d never met before) and I was excited and nervous! I made a few Indian dishes for the main meal but I wanted a killer dessert. 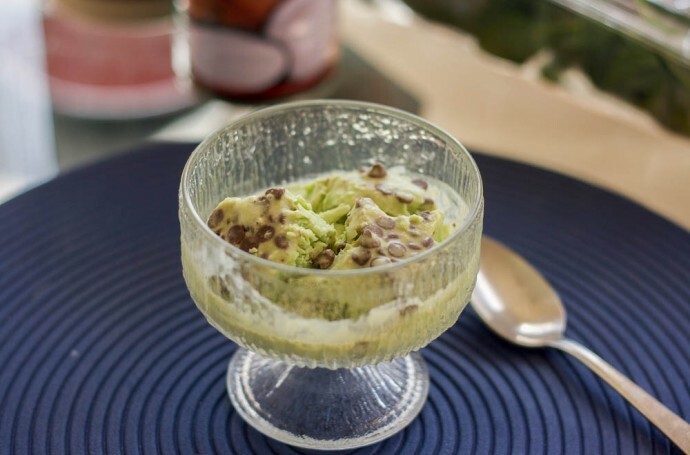 I also needed a dessert that was vegan and grain-free (there are a lot of dietary restrictions in our house currently) and wanted to use mint. Simply because I.LOVE.MINT. 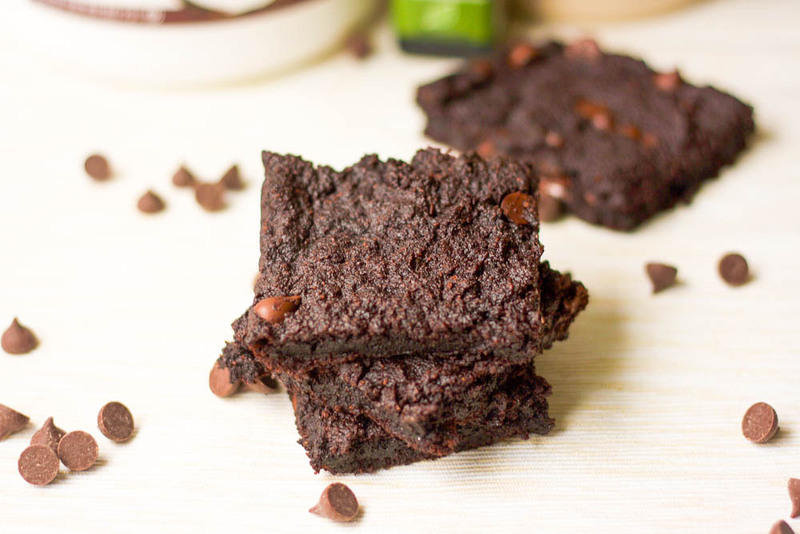 🙂 I experimented with this mint brownie recipe from scratch and it was absolutely perfect. This chickpea flour wrap is a vegan/gluten-free/grain-free person’s best friend. 🙂 I have been experimenting with going grain-free recently which my gut my has been lovin’. I eat a lot of Indian-Pakistani food (that’s where my blood is from!) and so wanted a roti replacement as I LOVE roti! Before going grain-free I would usually make my gluten-free buckwheat flour chapati/roti, but now needed a replacement. (*Update: a reader just told me that buckwheat is in fact a seed, not a grain! 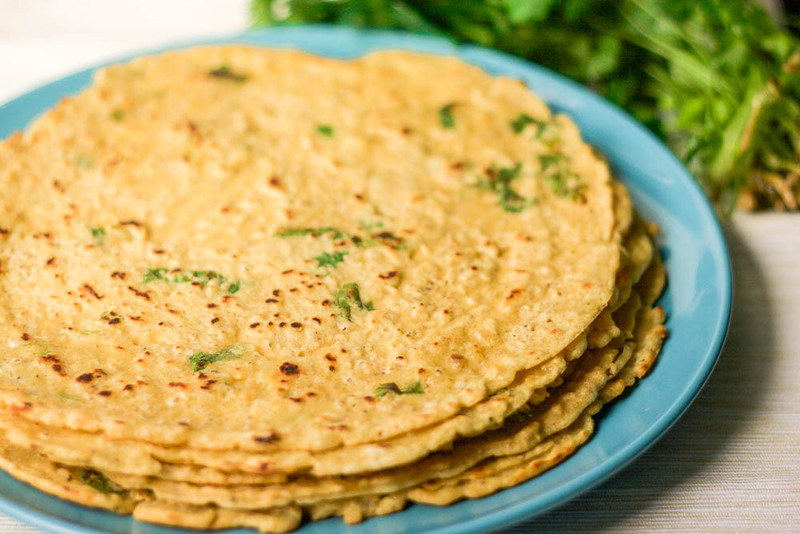 There is a traditional chickpea flour roti in India/Pakistan that they call “Besan Roti.” My Mom sometimes makes it and it’s delicious. The only problem though is that it is traditional quite stiff and not as malleable as regular roti. I used my Mama’s recipe as a template and adjusted it to make it more roti like. The result? Perfection. 🙂 Plus, only 2 ingredients are required! See my video and recipe for my chickpea flour wrap below. 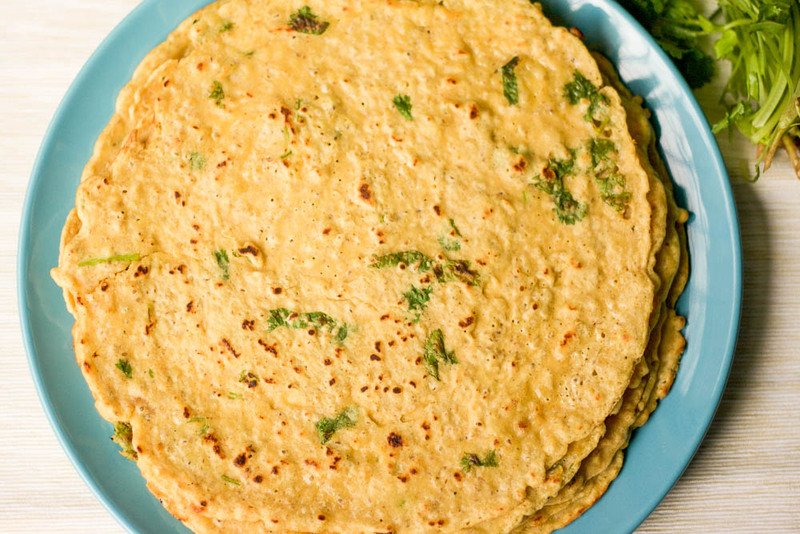 This chickpea flour wrap is absolutely perfect. 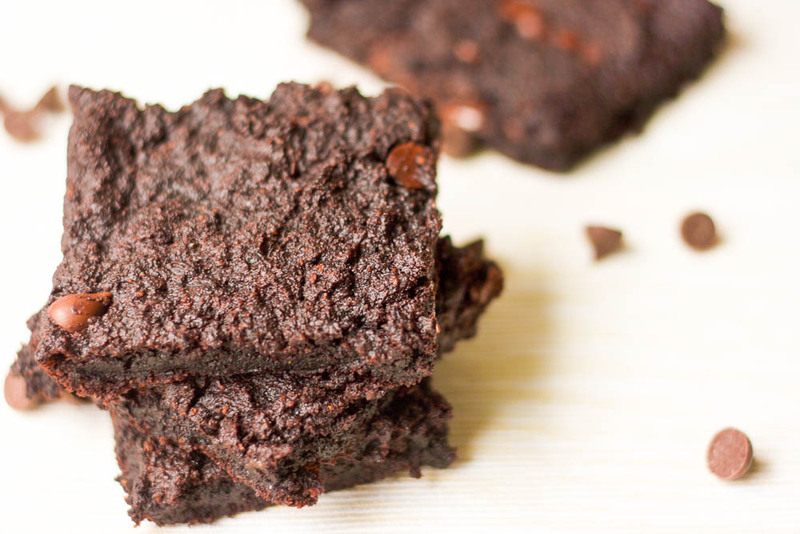 It's vegan, gluten-free and grain-free. Plus, it only requires two ingredients. Incredibly easy to make! and whatever else you think will be yummy! Pour a couple of tbsp of oil into a small bowl and set aside. Heat a large non-stick large frying pan over medium heat. Combine the chickpea flour, water and spices, if using, into a bowl and whisk very well. Add a few drops of oil into the pan and coat the pan. Using a 1/3 cup measuring cup for smaller wraps and 1/2 measuring cup for larger wraps, spoon out the chickpea into the pan. Use a spoon to spread out the batter in a circular motion making sure to cover any holes in the batter. You want it as thin as a crepe. Wait a couple of minutes and then flip over. (Each side should start to turn brown with brown spots). Cook for another couple of minutes on that side and then serve. If I'm using a pan that isn't very "non-stick" sometimes I dip a spoon into the oil and spread the oil around the edges of the pancake so that it's easier to flip. 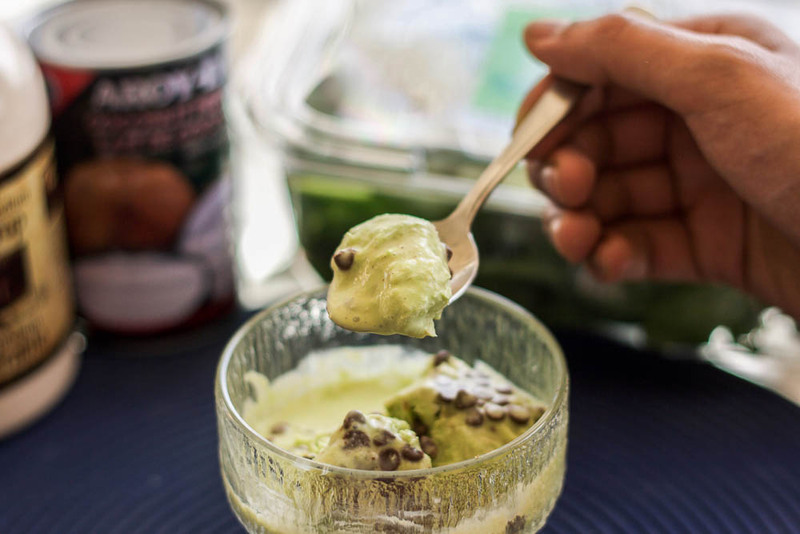 I’m a fan of all store-bought vegan ice cream options, but it’s so difficult to find mint chocolate chip. I decided to experiment with this ultra simple and easy recipe (only 4 ingredients!) without an ice cream maker. It came out absolutely delicious! I will be making this one again and again. Try it for yourself and let me know how it comes out. Throw all ingredients, except the chocolate chips if using, into your high powered blender (I use my Blendtec) or food processor and mix until totally smooth and you can't see any spinach pieces. Pour the mixture into a tupperware and stir in the chocolate chips, if using. I didn't use an ice cream maker for this so the ice cream did turn out a bit crystalized. I don't mind this but you could probably add some coconut oil to make it creamer / use an ice cream maker. 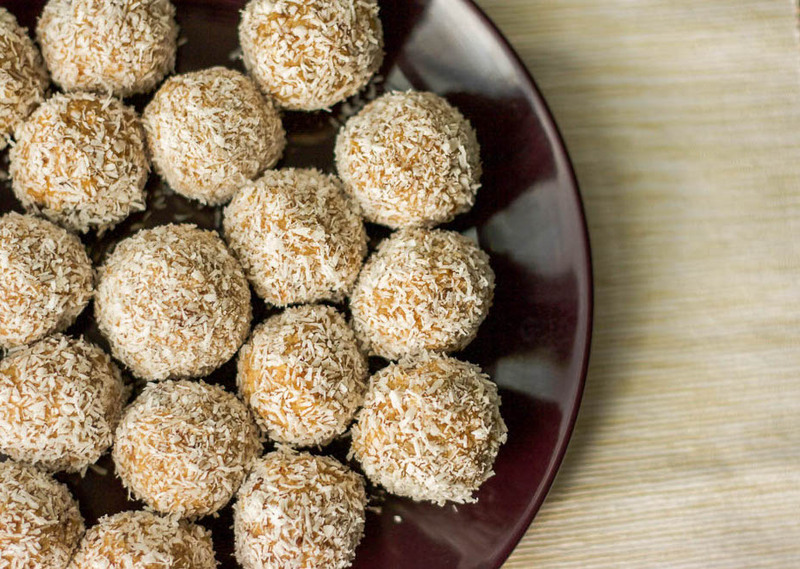 This is the story of how this recipe for date balls rolled in coconut came to life. The dessert was a hit! This one will go down as one of my favourite go-to super quick, healthy and yummy dessert recipes! Put dates into a food processor and processes until mushy. Add the walnuts (or whatever nut you are using) and mix well. They should look crumbly but should be able to stick nicely together. On a plate/cutting board, spread out the shredded coconut. Using a 1 tbsp measuring spoon, spoon out the date/nut mixture. Roll into a ball using your hands. 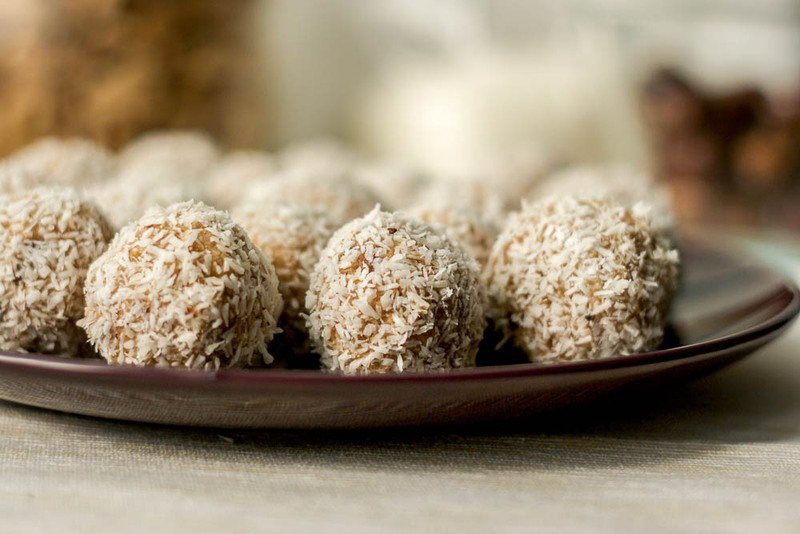 Roll out the ball onto the shredded coconut, making sure it's all nicely coconut. Do that for the remaining of the mixture. Should make about 20 balls. I think other types of nuts would also work (e.g. almonds, pecans). 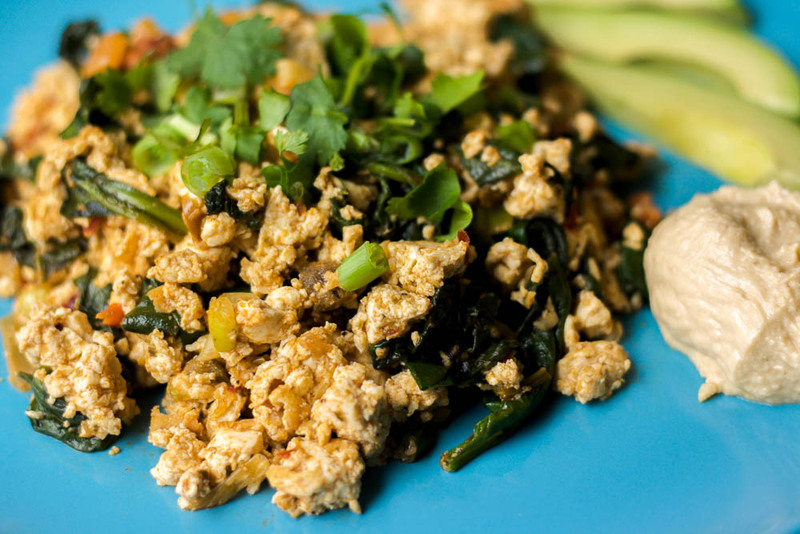 I love tofu scramble. 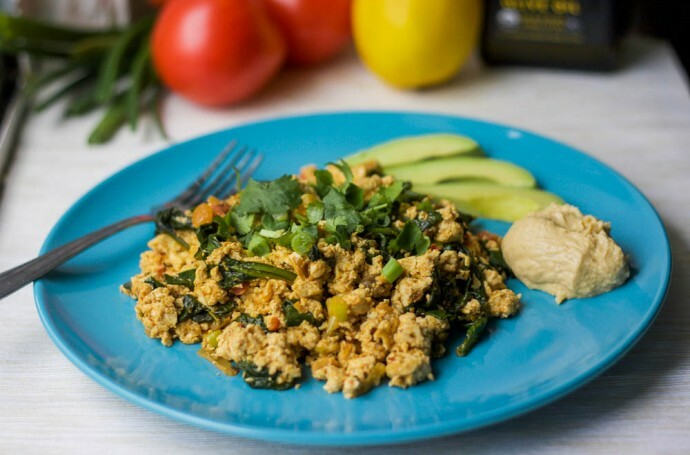 I’ve tried many variations of tofu scramble over the years but this tofu scramble recipe with nutritional yeast is absolutely amazing! Nutritional yeast is so versatile and is a vegan’s best friend. 🙂 It’s a terrific veggie/vegan dietary supplement and has a nutty (some even say cheesy) flavour. 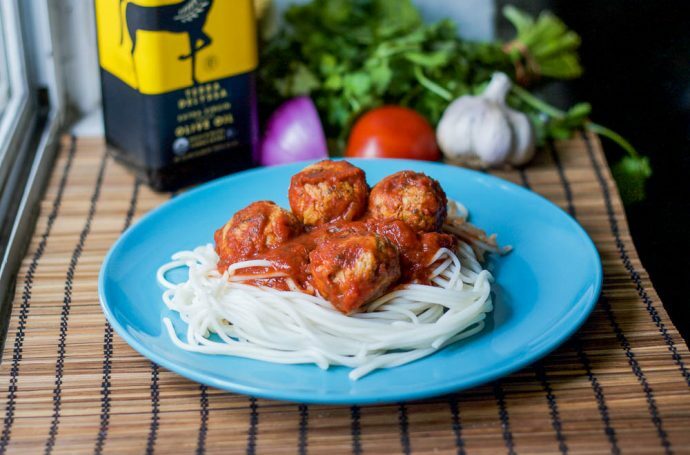 It’s also rich in vitamin B-12 and packed with protein –1 heaping tbsp has about 8 grams! Aside from it’s nutritional benefits and awesome taste, nutritional yeast is also a wonderful yellow colour! 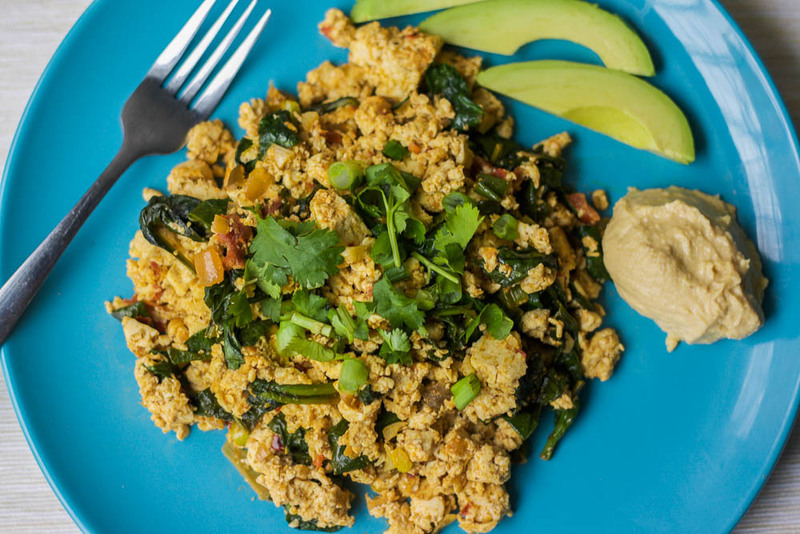 I like my tofu scramble to look like scrambled eggs (this way I get to trick the meat-eaters :P) and so the addition of nutritional yeast is perfect! 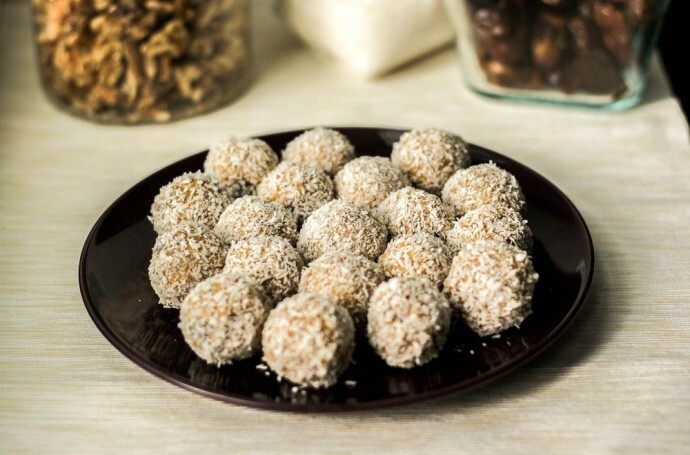 This recipe came out so wonderfully delicious and satisfying – try it for yourself and see. 😉 I had it with some hummus and avocado. Drain tofu (I usually do this by placing it between 2 plates, putting something heavy on top, and letting it sit for about 10-20 minutes and then draining the excess water). Crumble up the tofu with your hands and set aside. When hot, add the chopped garlic and sauté until fragrant. Next, add the crumbled tofu along with the onions, salsa/tomatoes, nutritional yeast, spinach and pesto, if using. Mix well. Add all the remaining spices and let cook for abut 5 minutes. If you like, garnish with some chopped cilantro and hummus and avocado. 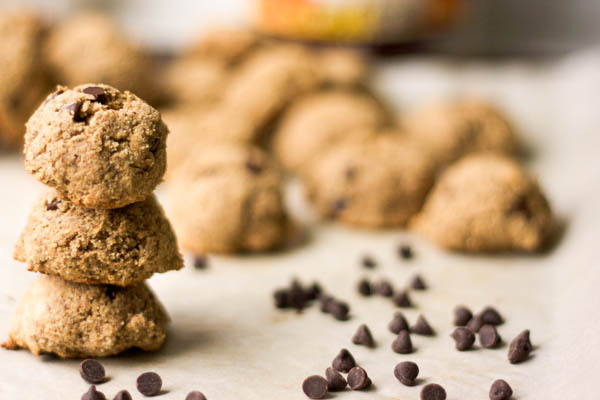 These grain free almond butter cookies are the result of my love for almond butter. I’m loving almond butter these days. Well, I love almond butter most days but because I’m currently on a zero to little grains diet, almond butter has become a staple in my pantry. I was heading over to a girlfriend’s house and told her that I would bring dessert. I had plenty of almond butter in the fridge so decided to experiment with these grain free almond butter cookies. They turned out fabulous! Combine 1 tbsp of ground chia with 3 tbsp of water in a bowl and set aside. Combine almond flour, salt, and baking soda into a bowl. Combine the almond butter, maple syrup, vanilla and chia + water mixture. Slowly fold in the chocolate chips. Using a tbsp spoon, add the cookie dough on the parchment paper and flatten to the desired thickness. Bake for 10-15 minutes or until the cookies start to brown. Cool on the pan for 20 minutes before removing (if you can wait that long :P). *If you don't have chia/are not vegan you can replace with one egg. Check out my post for What To Eat with Almond Butter, for some more almond butter inspiration! 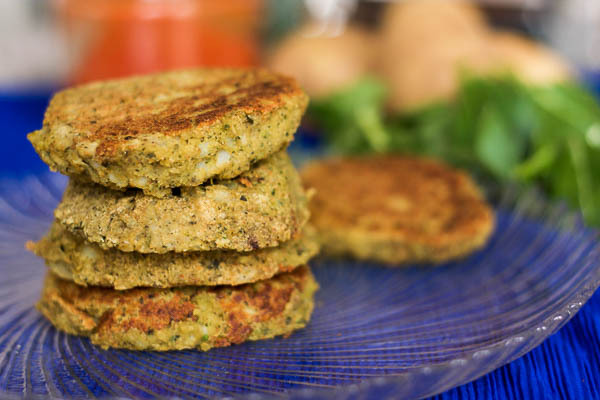 This amazing chickpea pattie recipe comes from my Mama (thanks mama!). The recipe is an adaptation of a traditional Punjabi dish made with potatoes called “Aloo Tikkis” (meaning potato patties). I try not to eat too many potatoes and so I asked my Mom to make it with chickpeas. She did and it was delicious. 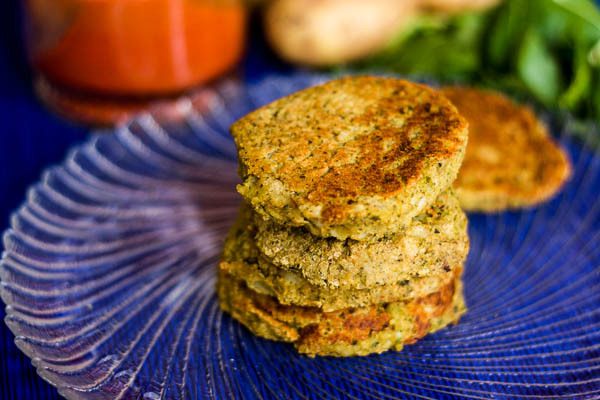 🙂 This chickpea pattie recipe is filled with indian spices so get ready for your mouth to explode with spicy amazingness! Combine the 3 tbsp of ground chia with the 1/2 cup of water in a bowl and set aside. Wash & cook the chickpeas until they are super soft (you will have to mash them by hand, so the softer they are the easier it will be for you). Once the chickpeas are cooked, drain any excess water and set aside. Grease a baking sheet and preheat oven to 400. 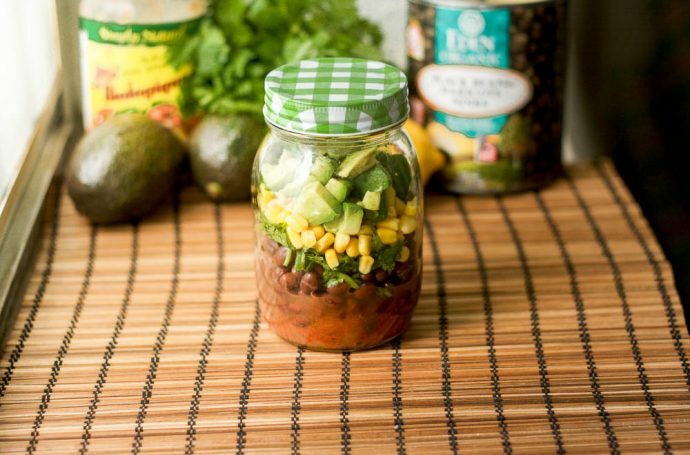 Chop the green onion, fresh cilantro and greens, if using, and set aside. Now it’s time to use your mom arms, yoga arms or if you are like me, your slightly weakling arms. 🙂 With a potato masher (or fork if you don’t have a masher), mash the chickpeas. You want to mash them just until you can’t see any more whole chickpeas. You still want them to keep their form. You don’t want to use a food processor because they will get too soft and won’t form properly into patties. Add all of the spices and the chia mixture to the chickpeas and mix with a spoon until everything is nicely combined. Using a 1/3 measuring cup, scoop up the chickpea mixture and place onto your greased baking sheet. Use your fingers to flatten your patties until they are about 2-3 inches thick. Bake at 400 for about 30-40 minutes, flipping them mid-way through. Enjoy them in your salad, in your burger, in a wrap or on their own! You can pan fry them right before you eat them so that they are nice and crispy. These freeze really well, so feel free to wrap them up and freeze them once they are cool. I made these flourless chocolate cupcakes with cocoa powder for my brother-in-law’s birthday last weekend (Happy Birthday Mufee!! :)) and they were a hit! Mufee has recently turned the big 4-0 (is it okay that I mention your age Mufee? :P) and so this birthday was a big deal. The family had conspired together to get Muf 40 gifts for his birthday and I was go get 6 of those 40! Yikes! That was stressful as my “love language” is definitely not gifts. Aside: Have you guys heard about love languages? It’s very interesting! It basically says that people express love in 5 different ways – gifts, quality time, words of affirmation, acts of service and physical touch. People express love in these different ways and, in turn, often expect to receive love in the same way. I, for instance, express love predominantly through acts of service (I like doing things for people, like making food! Hence, the food blog :P). After service, I probably express love through (ranking from most important to least) quality time, physical touch, words of affirmation and then gifts would be last. Because acts of service is most important and gifts is least, I am not a gift giver (or not a good one, at the very least). This also means that rather than valuing gifts myself, I would rather have people do things for me (like the dishes Irfan!). If you’d like, you can take the love languages test. Okay, sorry for the rant, back to the cupcakes! Anyhow, it was Mufee’s birthday and I was to get him six gifts. As gifts is not my thang, I decided (actually Jemila, my sista from anotha motha, suggested) to make cupcakes instead. 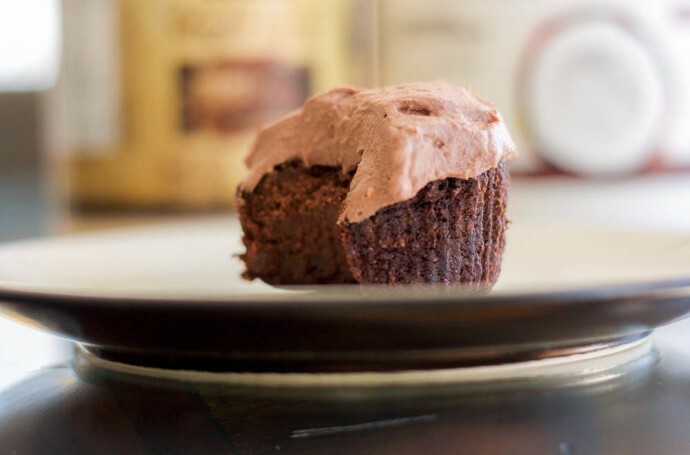 I also try to eat grain free and had some cocoa powder and so I experimented with flourless chocolate cupcakes with cocoa powder. They.were.darn.tasty. Even the unhealthy eaters liked them. 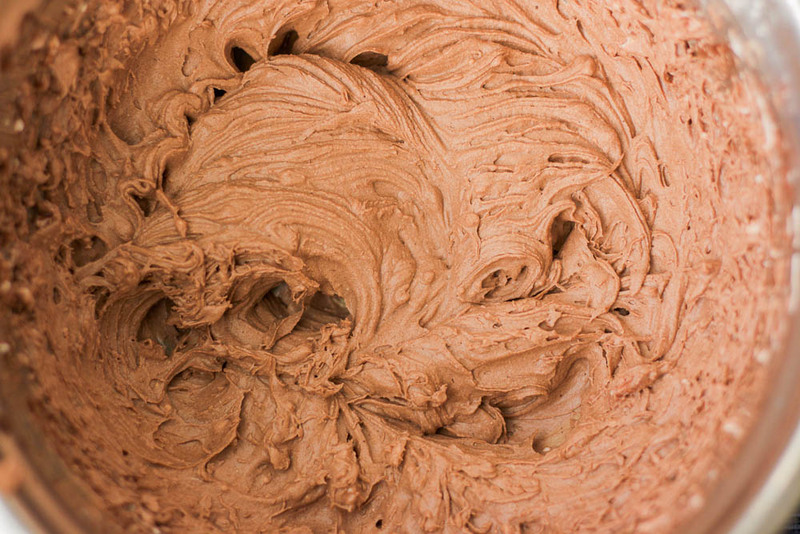 I’ve been on the search for a vegan chocolate frosting no margarine recipe for a while now! Many of the vegan frosting or icing recipes I have come across include some type of vegan margarine or butter. 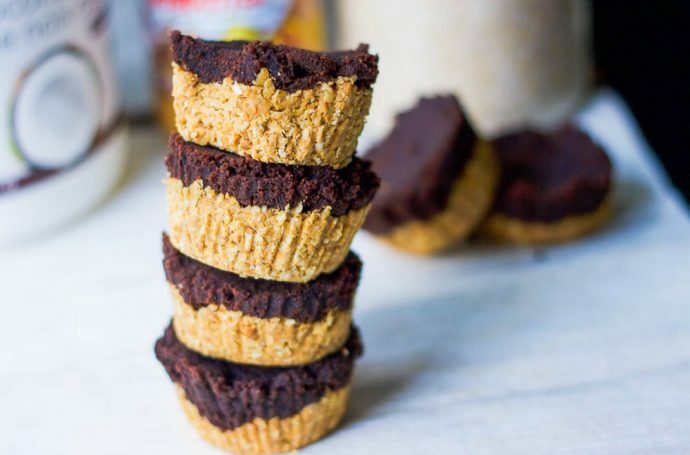 The thought of having a frosting with vegan margarine or butter wasn’t terribly exciting for me and so I wanted a healthier and yummier alternative. 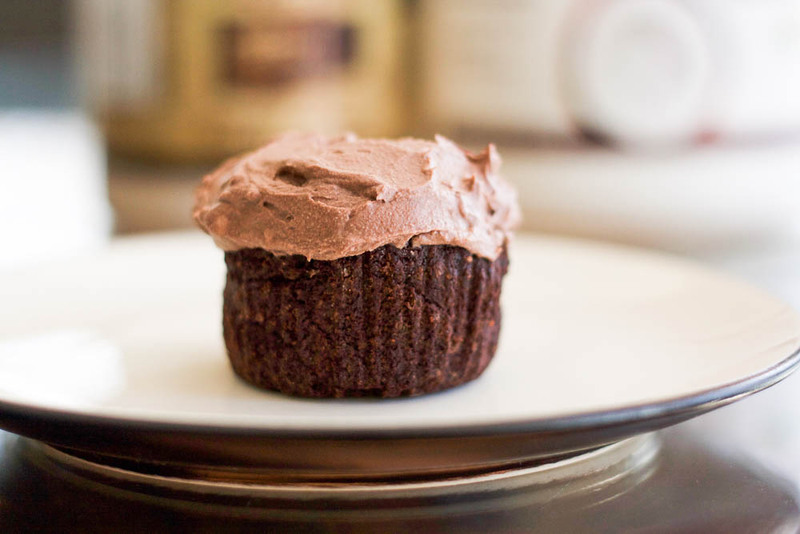 This vegan chocolate frosting recipe is so good you can eat it by itself (I definitely did!). I made this to go along my flourless chocolate cupcakes with cocoa powder recipe which I made for my brother-in-law’s birthday. It was a hit! Remove the coconut “meat” from the can (this is the solidified white part of the coconut milk) and place into a medium sized bowl. You can save the rest of the coconut liquid (I usually freeze it to use in other baked goods) or you can drink it! 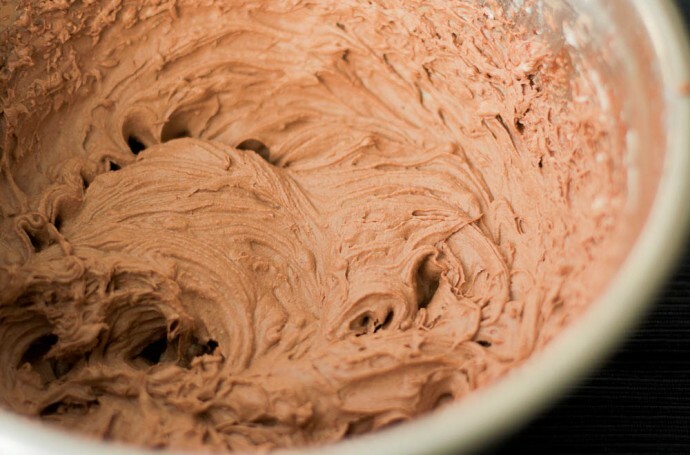 Add the remaining ingredients to the bowl and whip it up with a hand mixer until completely smooth. Spread on your goodies / eat alone. Note that the frosting melts quickly so keep it in the fridge until right before you are ready to eat or serve it.